The Bridal Lounge was founded in 2016 by experienced Retail Manager, Abi and is currently running her showroom as a one Woman team. Her vision was to help Brides to be find their dream Wedding dress and to create a memorable Bridal shopping experience in a friendly and relaxed setting with trustworthy and honest advise. 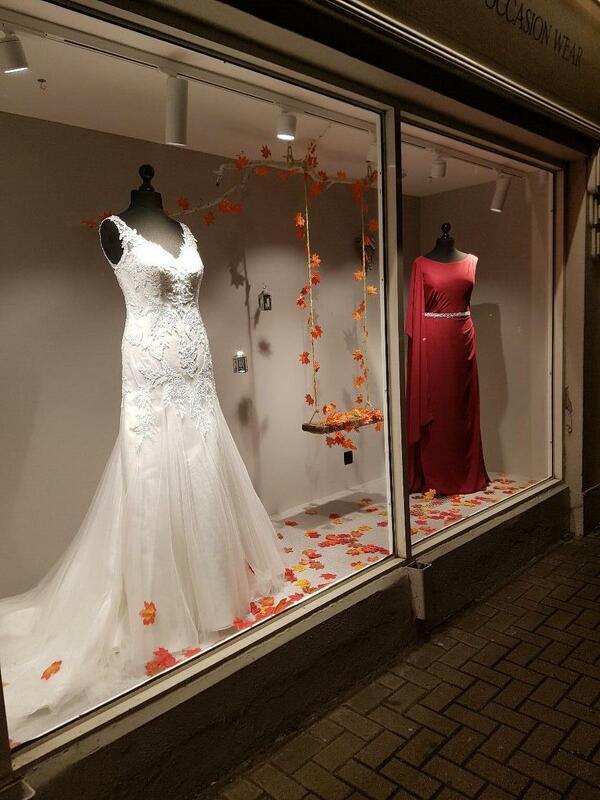 Originally located within her home in Co Westmeath, The Bridal Lounge has now taken the huge leap of moving into a new luxurious showroom in Mullingar town centre. Offering an array of delicately chosen gowns from sought after International designers, there is a dream gown for Brides of all different styles, shapes, sizes and budgets. The Bridal Lounge offers private 1.5 hour appointments where you will have the opportunity to seek advise on Bridal styling and the most exciting aspect …. trying on Wedding dresses. The Bridal Lounge believes that as a Bride, you should be made to feel special at every stage of your wedding story and that choosing the perfect dress should be a magical and enjoyable experience. The Bridal Lounge looks forward to making your Bridal shopping experience a memorable one very soon! I went to a couple of dress shops before booking an appointment with Abi, at which point I was starting to stress out but I needn't have worried. Abi is a true professional, lovely to deal with and makes you feel very comfortable, she really knows her stuff and will help you find the dress that's right for you. Would definitely recommend???? I had an amazing experience at The Bridal lounge. They have a great selection of dresses in a beautiful shop. Abi is very welcoming, knowledgeable and professional. I thoroughly enjoyed my visit and Abi found me my dream dress! I would highly recommend The Bridal Lounge. Hi Eileen, Thank You so much for taking the time to review my service. I'm glad it was such a good experience for you! I look forward to seeing you in 2019!! Hi Toni, thanks so much for your review! I'm delighted it was a great experience for you! Can't wait to see your Wedding pics! Had such a lovely experience at The Bridal Lounge, Abi is excellent at what she does and made the whole experience so pleasant and relaxing. I purchased my wedding dress and my bridesmaids here and I couldn’t be happier with them!! Would highly recommend The Bridal lounge for any future brides out there!! Hi Sharon, thanks so much for your review. I'm so glad you enjoyed your Bridal experience in store with myself. It was a pleasure looking after you and really looking forward to seeing your pictures! I cannot recommend the bridal lounge enough.The store is beautiful.I tried some beautiful dresses here and fell in love with one. Abi is so lovely and is amazing at what she does, making the experience so relaxing,fun and special. Thanks very much Denise for taking the time to review my shop. You look amazing in your dress, I'm really looking forward to seeing your pictures! Best of luck for the Big Day! Thanks so much Olivia for your review. I'm delighted that you all looked and felt amazing on your special day! You were a stunning Bride! Best of luck to Orna with the baby! Abi was absolutely fantastic when i shopped for my wedding dress. She was very patient when I was trying on dresses, I had my newborn son with me and she had no issues with settling him during our appointment. She managed to locate the exact style of veil I was looking for too. On my wedding day I had dress emergency and Abi called to my hotel and sorted out the issue without any delay. I don’t think there is a better wedding dresssupplier than Abi! Thanks so much Emma for taking the time to review my shop, especially the very busy Lady you are! It just worked out perfect that I was free that morning to be able to assist you. It was really lovely for me to experience the hustle and bustle of the wedding prep for one of my Brides! I'm waiting patiently to see your pics ??? ?